Next Friday, I will be posting one of my own short stories. And I mean short. Weighing in at just under 1800 words (about 7 pages), Waiting for the Train is the shortest complete work I’ve written (well, at least since I made the decision that I wanted to be a writer). It tells the story of Marianne Jordano, an unhappily married woman at the end of her wits, waiting in a crowded subway station. Her train is running late, and Marianne is about to do something drastic. I met Jill Elizabeth at Book Blogs. If you’re a big reader, you would love this site (although it’s a little overwhelming if you’re a writer trying to promote your books). I liked this post of hers because I know there are many readers out there who are looking for a new book to read but maybe don’t have a lot of time on their hands. One of Jill's top ten "Little Books with Big Stories"
A former corporate attorney and government relations/health policy executive, Jill-Elizabeth walked away from that world (well, skipped actually) and toward a more literary life (equally challenging, but infinitely more enjoyable). If you enjoyed this list, please visit her at Jill-Elizabeth.com, the official home of All Things Jill-Elizabeth – that is, all of the teehees, musings, rants, book reviews, writing exercises, and witticisms of her burgeoning writing career. So, like everyone else I know, I never seem to have enough time to read anymore. This is annoying for many reasons, primarily because it means that the “to be read” pile continues to grow on what feels like an exponential scale. But also because of my reading challenges – one external and one internal. The external (111 in ’11) says I need to read (duh) 111 books this year. The internal doesn’t have a specific requirement, but does require that I look at statistical comparisons month-by-month between this year and the past nearly ten years. I know, I know – I’ve complained about the difficulties of reading time and reading challenges in here before. But I’m going to do it again. With a twist. The twist: this time not only am I complaining about the lack of time for numerous and lengthy books, but I’m also providing a nifty solution to the problem. That is, today I will tell you how I turned a sneaky-ish way of increasing my finished-book count into some really great finds. Here’s how it started: angered over declining statistics, our fearless heroine (c’est moi) decided to turn to her favorite source of all things information. Yup, she turned to Google. And what did she Google, you might ask? Teehee – she Googled “best short novels” of course. Teehee indeed, eh? Traditionally, I do not enjoy short books or stories, so many of the recommendations that Google turned up were new to me. Since I don’t usually like the short stuff so good, I decided to check a few of them out from the local library (hooray for the library, she said! ), which was another great thing that came out of my pathetic need to perform well in a stated challenge/test. I was pleasantly surprised to note how many of these very short books were worth more than their page-count would otherwise seem to indicate. Sure, a few of them suffered from my common complaint about short stories generally – the brief page/word count meant that occasionally the characters were not as fully developed as I would have liked, or the plot lines were relatively simple and/or twist-free. But a number of them really surprised me in a very good way. So here you have it, some statistic-padding books for your own reading tally/challenge that I think you will enjoy not only for their brevity but also for their stories. Enjoy! What are your thoughts on these books? Liked them? Not so much? Are there any others you could add to this list? And if you like this list and Jill’s writing style, I would hope that you would pay her a visit at her own blog. And don’t forget to check back next Friday for my short story, Waiting for the Train. 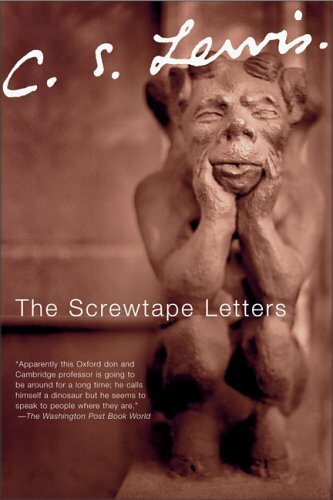 I have not heard good things about The Screwtape Letters by c.s. Lewis from quite a few people. However, I loved the narnia books by c.s. Lewis and while the combines series is rather hefty, I think each individual story is fairly short. I would also add A Study in Scarlet by arthur Conan Doyle or the strange case of dr. Jekll and mr. Hyde to the list. I don’t think either of them are very long, but I took a lot away from both. Hey Shanan, for some reason your comment went to my spam folder, but thankfully just found it. Not sure why it went there. Thanks for your additions and for your kind words regarding the post. I’ll be sure to send the regards to Jill-Elizabeth. Thanks for your comment Shana – Screwtape is more like CS Lewis’s nonfiction/philosophy than the Narnia books, and that’s not for everyone… The individual books in that are pretty short. I haven’t read Jekyll/Hyde, if you can believe it, and will look for it and the ACD – thanks! Both are barely over 100 pages. People enjoy different books and authors. Gaiman is the only author on the list that I like. Bad Blaze! Gaiman is FABULOUS and one of my all-time favorites Blaze – he is one of the only people whose short stories I actively seek out. Honestly, the man could write cereal boxes that were worth the read… 🙂 Before my google search for short books I hadn’t even heard of a few of these authors/books – and while I love Ayn Rand’s massive novels, I could never get into Anthem… So we’re all at odds on these, I guess, and no need for self-castigation! Heaven forbid we all agreed on these types of things. A little contention (or at least difference of opinion) keeps things interesting. Speaking of Gaiman, I have a good friend who is really trying to get me to read his stuff. It’s on the list. Thanks for checking out this post. Hope you’ll check back this Friday, whether it’s for my original intended short story, Waiting for the Train, or hopefully my change of plans Flash Friday (still waiting to hear from Gaynor). Scratch that last comment. Just heard from Gaynor. Looking forward to my first fridayflash. Excellent – will definitely check it out! And believe me, Gaiman is WELL worth the time… He uses language beautifully and his stories let you into weird, twisty, intriguing and very original worlds. Great post, I also follow Jill Elizabeth and enjoy her blog. Aww – thanks Man of la Book!